Bilingual Fun Spanish for Children! You want the best for your child, and you know being bilingual is important. With over 28 million Spanish speaking people in this country, teaching kids Spanish can offer exceptional benefits! 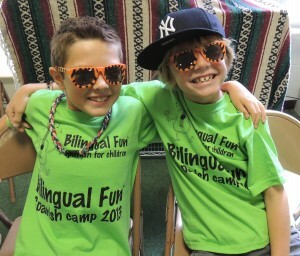 Let the Bilingual Fun program show your child how fun and easy learning Spanish can be! Developed by bilingual educators & parents, the Bilingual Fun program provides an exciting head start to teaching children Spanish! Featured on Good Morning America, ABC News, Redbook Magazine, Entrepreneur.com, and more, check out the buzz about Bilingual Fun! The opportunity to become bilingual is one of the greatest gifts you can give your child! The Bilingual Fun program enables your child to learn Spanish in a natural learning environment through: fun and interactive lessons, communicative activities, music, movement, songs, games, and more! Kids learn best when they are active learners, and Bilingual Fun teachs kids Spanish vocabulary, basic grammar and pronunciation by using Spanish songs, games, books, and interactive lessons. 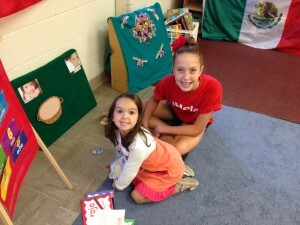 Find out more about Bilingual Fun’s interactive Spanish learning program. Classes are offered at preschools, day cares, elementary schools, homeschool groups, private in home classes, and community parent/child classes. Contact us today to learn how your child can join a class! Being bilingual means a brighter future!